Attracts Bluebirds by feeding them mealworms! 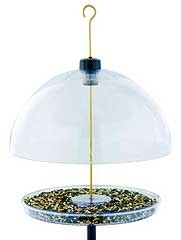 Adjustable dome keeps large birds and weather out of the bird feeder. Heavy-duty polycarbonate, UV resistant. Large tray holds seed, mealworms, fruit or suet. Easy to fill and clean. 15 inch diameter squirrel guard dome covers feeder bowl. Seed valve controls seed flow. Green accents. 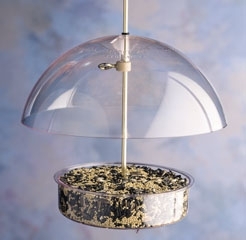 7 inch x 1 3/4 inch dish with 10 inch cover and brass rod, for any seed, mealworms, suet or fruit. Hang or pole mount. Exclusive 2 in 1 feeding ports, simply twist the port to change from mixed seed to thistle seed. Sure-lock cap system keeps squirrels and wind out. 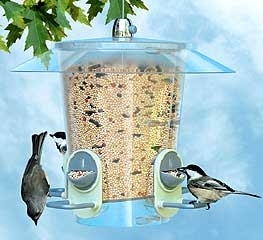 Bird preferred U-shaped perches for attracting more birds. A versatile platform feeder you can hang or pole mount. The 15in dome can be lowered to exclude large birds and protect the platform from the weather. The 13in diameter platform holds a pound of seed but you can also offer mealworms or suet or fruit. 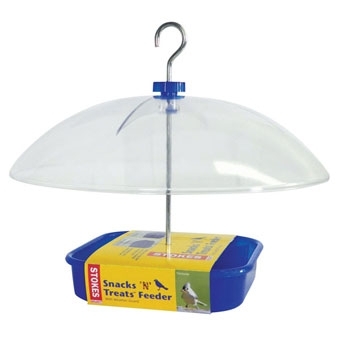 Use to feed many snacks and treats to your birds including dried mealworms, fruit, seeds, suet, jelly, and more.Feeding dish includes a divider to offer up to 2 different types of treats.Weather guard protects both birds and food from weather. Weather guard is height adjustable for bird feeder preference. 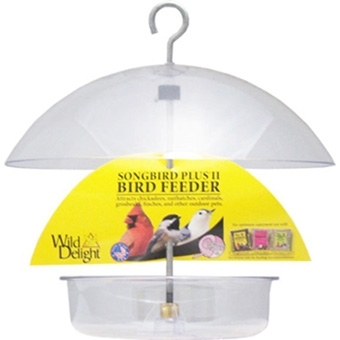 Feeder is easy to clean, fill and attracts a wide variety of birds. 10in diameter adjustable dome. Holds just under 1lb. of seed in dish. Aluminum rod for hanging. 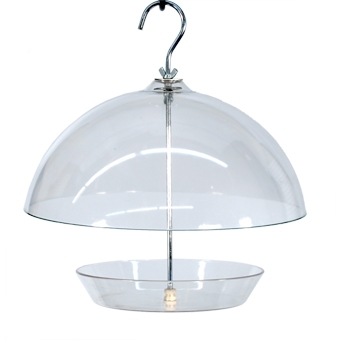 Clear polycarbonate dome and feeder dish. © 2019 Morristown Agway. All rights reserved.